It's the weekend and a big one for rugby around the planet. Unfortunately there's been a few delays on here in terms of updates and previews, but we're back at it now, with this great try from last weekend. If you've checked RD in the past day or so you will have noticed that despite normal activity on Facebook and Twitter, the site hasn't received too many new updates. The reason is that unfortunately the Blogger service, which is the content management system behind the site, was down for over 20 hours. This meant it was impossible to update or edit anything on the site. What is also reinforces is the need to get the new site up and running, and off of this CMS, asap. That's going to become a much higher priority over the next few weeks, so please bear with us as some hard graft is done behind the scenes, that will no doubt bring you a far more enjoyable RD experience in future. Speaking of hard graft, this is a try that some of you wanted to see again from last weekend. 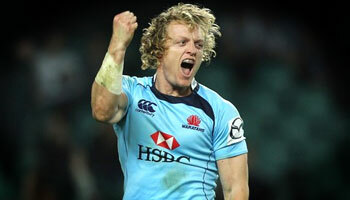 It features Ryan Cross of the Waratahs, playing against his old side, the Force, scoring a try that came directly from a penalty attempt on goal. We saw something similar with Toulouse recently from Florian Fritz against Leinster, and with Ollie Phillips for Stade Francais last year. What it shows, whenever this happens, is that it is definitely worth chasing those long kicks at goal. Every now and then one of them might just come off, and you'll more than likely earn your side a much needed seven points that you might not have had otherwise. So once again, thanks for the patience, and enjoy the busy weekend of rugby. Funny how France, French teams or French people seem to be linked always to this kind of try. Should I conclude from all of this that Australia is a part of French territory, and fortunatelly, WE, as Frenchmen should raise our expectations and hope in regard to the upcoming WC ...that actually we do have a chance to win the WC? Once more apologies for this poor comment but I just watched a 1/4 final of top 14, supposingly the best of French Rugby Union..... that does explain a lot. Question for anyone who know the rules - is there any time a penalty kick can't be chased up like this? For example, could you arrange a set piece where you deliberately kick high and short so your chasers collect the ball a few metres out? Doubt it work often because you do it successfully once and the oppo will prepare for it, but it's a relatively easy seven points if you can get away with it/pull it off. For instance if the clock reads 85:00 and you have a penalty kick and miss, the ball is still in play (if it stays in that is) so the opposition can run it back at you even though the clock is up. If it was deliberate, it is illegal. It has to be a "good-faith" attempt at a penalty goal. To offer another perspective of legalese, even if it's not forbidden by the letter of the laws, it's against the spirit. Again, this is my perspective, and something I plan on asking tomorrow when I take my Level 1 course.